Check out one of our recent commodity trading articles in the September 2013 issue of Pitnews Magazine! 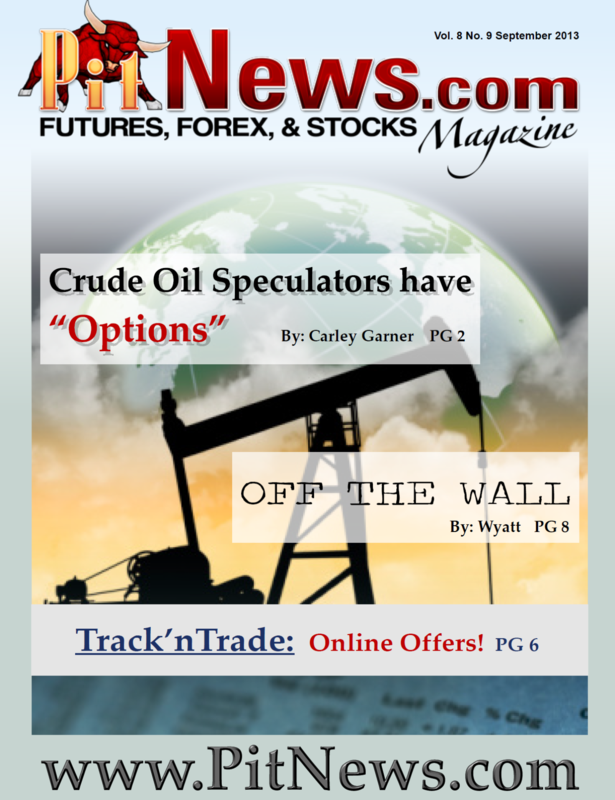 Crude Oil Speculators have "Options"
Crude oil is perhaps the most notorious commodity market but it is also among the most treacherous. Nonetheless, speculators are drawn toward the leverage and volatility crude oil provides...and, more importantly, the stories of riches made and lost by its participants. Before risking your hard-earned money speculating in crude oil, it is important to be aware of all speculative avenues available. For instance, it is possible to trade oil via ETF's that attempt to track the price of crude such as the USO (United States Oil); alternatively, investors can place bets on crude oil via the stock shares of firms that are correlated to crude oil prices, such as COP (Conoco Phillips); or traders can directly speculate in the price of oil through the purchase and sale of futures and options contracts. Despite the stock market alternatives, I believe futures, and options on futures, offer the only trading venue that provides the efficiency and the market access necessary to effectively trade price fluctuations in crude oil. My preference for futures might be influenced by the fact that I am a commodity broker, but it goes much deeper than that. Here are a few key advantages to futures over equities. Crude futures open for trade Sunday evening at the NYMEX (New York Mercantile Exchange) branch of the CME Group and, for all intents and purposes, oil futures trade around the clock until Friday afternoon. On the contrary, ETF and Stock traders are able to execute trades during the official day session of the NYSE, and similar exchanges, as well as in the designated pre-open and after-market sessions (which are often illiquid). The entire span of trading is limited to approximately thirteen hours...or less.